Foreign Minister Mevlüt Çavuşoğlu addressed bilateral relations with a host of NATO allies Thursday during a gathering of the alliance's top diplomats in Washington. Çavuşoğlu met on the meeting's sidelines with the foreign ministers of Norway, Germany, Canada, France and Montenegro as the alliance marks its 70th anniversary, in addition to participating in two sessions of all ministers. "At #NATO #ForMin 1st session, stated that on its 70th anniversary, unity, cohesion&solidarity are key to future of the Alliance! #NATO70," he wrote on the micro blogging website before heading into a second session. U.S. President Donald Trump's national security adviser John Bolton said in a tweet later Thursday that he "had a productive meeting" with Çavuşoğlu, and wished him enjoyable travels in the U.S.
At the meeting Thursday, a series of measures were approved aimed at countering Russia in the Black Sea region. The foreign ministers agreed to provide Georgia and Ukraine with increased maritime cooperation, patrols and port visits. Both countries have faced Russian aggression and have aspirations to join the alliance. Trump has questioned the value of the alliance and criticized some members for not spending enough on defense. Stoltenberg acknowledged that the issue of Turkey's purchase of an S-400 missile defense system from Russia as a point of severe contention between Washington and Ankara and expressed hope that a resolution was possible. "We fully realize that this is now a challenge," he said. "There's great opportunities for the United States and Turkey to work closer together," U.S. Secretary of State Mike Pompeo told a news conference at the end of a meeting of NATO foreign ministers. "I had a good long conversation with the Turkish foreign minister yesterday and I'm very confident we'll find a path forward." Turkey's decision to make a $2.5-billion purchase of two S-400 air defense systems with four batteries from Russia culminated in an agreement signed by both sides on Dec. 29, 2017. This led to strong opposition from the U.S. which stipulated that Turkey scrap the deal as a precondition to its own sale of Patriot defense systems to Ankara. Turkey has vehemently rejected Washington's calls, with President Recep Tayyip Erdoğan saying on April 3 that the purchase was a decision for Turkey to make. The S-400 is Russia's most advanced long-range anti-aircraft missile system and can carry three types of missiles capable of destroying targets including ballistic and cruise missiles. The system can track and engage up to 300 targets at a time and has an altitude ceiling of 27 kilometers (17 miles). 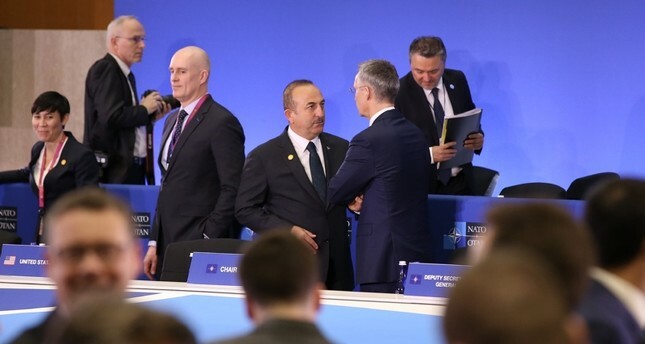 "The purchase from Russia is a done deal," Çavuşoğlu said at a panel organized by the Atlantic Council titled "Turkey's Role in NATO and Regional Security Challenges" on Wednesday. "We are not choosing between Russia and any other allies… We don't see our relations with Russia as an alternative to our relations with others. And nobody, neither West nor Russia, should or can ask us to choose," he said, later emphasizing that the S-400 deal did not signal warming toward Moscow, with whom Ankara disagrees on several regional issues, including aggression in the Black Sea and annexation of the Crimean peninsula.